Zetta Feder is all smiles while skiing with members of a cardiac rehab group Thursday at Aspen Mountain. Aspen Times photo/Mark Fox. “Is anyone going to time our runs to see who wins?” a gentleman asks.”Let me tell you, if you’re standing vertical, you’re a winner,” a woman quickly responds.That seemed to be the consensus yesterday morning as around 25 patients who have defied age, expectation and near death gathered at the gondola plaza for a day of skiing and celebrating on Aspen Mountain. Yesterday was the fourth annual cardiac rehabilitation ski day, an event organized for patients of Aspen Valley Hospital who have recovered from either a heart attack, a bypass surgery or both. Aspen Mountain seems a strange, forbidding choice for the group, but they display the attitude that led them here in the first place – “Buttermilk is for babies,” one skier explains. 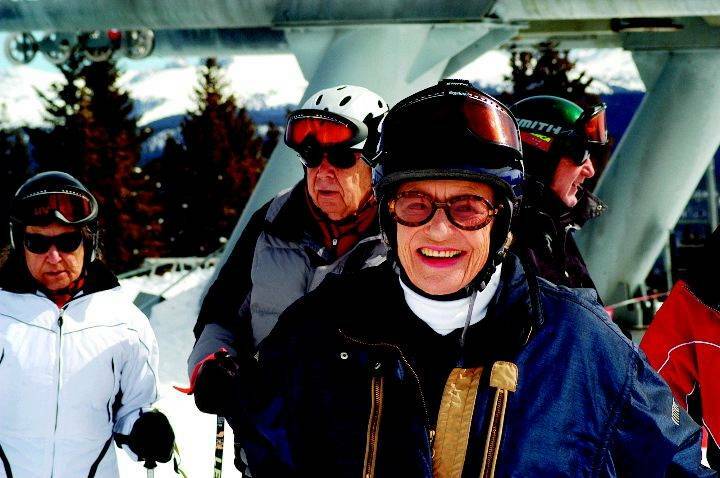 Many of the patients ski on their own four or five days a week. Even so, the group was told not to venture off the groomed runs. When you’ve got a corduroy scar traversing down your chest, as many of these skiers do, it’s best to stay on the corduroy snow.Most of the patients are older men. But there are some surprise faces in the group. Erik Shelton, indistinguishable from the host of ski-bums loafing around the plaza, was an otherwise healthy 31-year-old when he suffered a heart attack last fall. He had a congenital heart condition he knew nothing about until it landed him in an intensive care unit for four days. Like everyone in the group, it was a strenuous journey from hospital bed to the base of Aspen Mountain.”I set the record at the cardiac clinic,” he says proudly. “I walked 115 floors on the Stairmaster in seven minutes. That’s a record I think will probably hold up, unless some 20-year-old decides to have a heart attack.”Like it has been for poets for centuries, the heart for these patients is more than just a crucial organ. Heart attack and bypass surgery survivors almost invariably suffer depression during recovery. “When you have some sort of insult to the heart, how could it not impact your outlook on life and yourself,” Durham says.